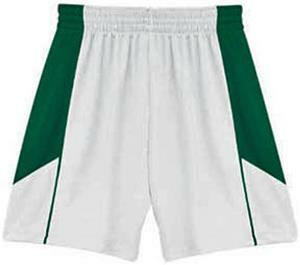 High 5 Varsity Performance Softball Game Shorts Closeout. 100% heavyweight eyelet polyester with Essortex moisture management technology. 100% polyester tricot knit liner in home whites for double thickness. Contrasting piping and side panels. 2" covered elastic waistband with inside draw cord. Coordinates with Style 32200 Varsity Performance Game Jersey. Sizes: 20-22" 23-24" 24-25" 25-27" 28-30" 31-33" 34-36" 37-39"
good quality but run large.